I love slow cookers, I always owned one, way back since the 80’s. They were first introduced in the US in the 70’s when many women started to go out to work, so they could prepare family meals in the morning by just putting all the raw ingredients in the crock pot and then finding a piping hot meal when they returned home. Slow cooker or crockpots (the original name was actually Crock-Pot) are economical to use and can make great meals out of budget ingredients like cheaper cuts of meats. You can just put everything raw inside your crock pot or else sear the meat beforehand if you wish. 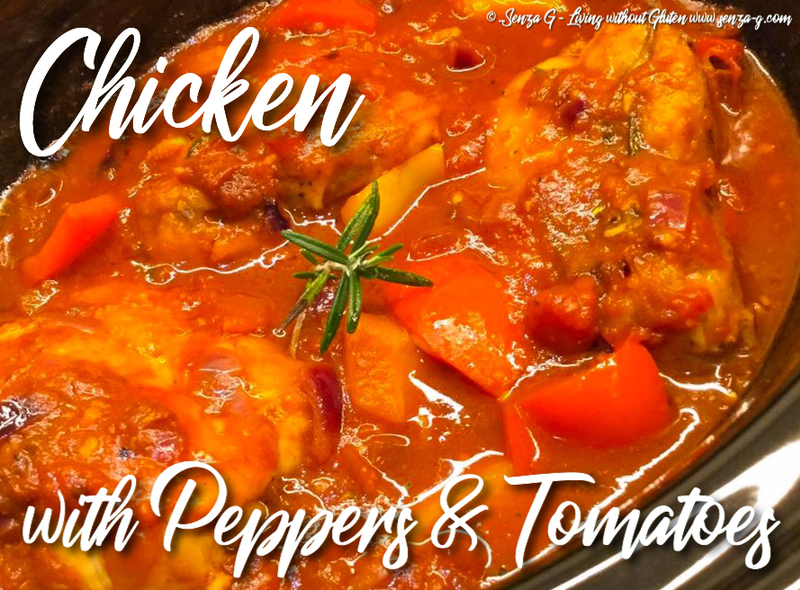 I made this very easy Chicken with Peppers & Tomatoes which I served with some lovely creamy mashed potatoes. Please excuse the quality of the photo, but I had lost all the photos one time when I upgraded the software and this was a low res photo I had posted on Facebook. Hopefully I will replace it when I make this dish again! But at least you get an idea of the finished dish. Heat a little olive oil in a large pan over medium-​high heat. Work­ing in batches, brown the chicken on all sides. Remove and place in your slow cooker. In the same pan, add the onion and sauté until just translu­cent, then add the gar­lic and red and yellow bell pep­pers. Cook until lightly browned, stir­ring often with a wooden spoon. Add the chili, mixed spice, sundried tomatoes, paprika, tomato paste and keep stirring to combine. Add the wine, the vinegar, the stock, the chopped tomatoes, the honey, the rosemary and mix well. Bring to a boil. Lower the heat and season with salt and freshly ground pepper. Pour the sauce over the chicken in the slow cooker, tuck in the bay leaves, cover and leave to cook for a few hours depending on your slowcooker. Serve with plain boiled rice, mashed potatoes or creamy polenta.